Although the attractions of New Zealand's South Island may be more well known than those of the North, guest blogger Candace Rardon discovers there are many sights that should not be missed only a short drive away from Auckland. When I decided to drive around the North Island of New Zealand for a month after a year-long working holiday in the country, there was only one question many of my friends asked: Why? It’s true that when most people think of the natural beauty New Zealand has to offer, the images that come to mind are found in the southern half of the country - be it the golden beaches of the Abel Tasman National Park, the icy slopes of the Fox and Franz Josef glaciers, or the snow-capped peaks of the Southern Alps. But the more I drove around the North Island, the more I began to regret spending so much time down south, instead of taking advantage of all there was to do and see up north. If you’re heading to New Zealand, here are five northern destinations you might think about adding to your itinerary. What’s more, if you’re flying into Auckland, all five are within driving distance, making them easy escapes if you’re keen to get out and explore. Located near the far end of the finger of land that extends from the rest of the North Island, the town of Paihia makes for a great base from which to explore the Far North. Although you might be tempted to spend most of your time on the bay’s beautiful beaches, make time for a tour up to Cape Reinga, the country’s northernmost point, as well as a drive along Ninety Mile Beach. If you’re interested in learning more about the country’s history, visit the Waitangi Treaty Grounds, where the Treaty of Waitangi essentially signed New Zealand into existence in 1840. Although known for its role in the historic goldrush of the late 1800s, it’s the beaches that draw most people to this corner of the country today. 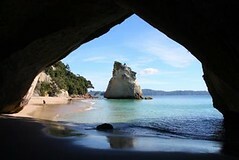 Not far from the main town of Whitianga, Hot Water Beach is especially fascinating. Most hotels and hostels in the area will loan you a shovel to take with you when you visit. Once you arrive at low-tide, follow the crowds and start digging - soon enough, you’ll hit not gold, but water so warm it’ll burn your feet. At just the right temperature, though, it becomes your own personal spa. This little island (whose full Maori name is Te Puia o Whakaari, or “to make visible”) is considered New Zealand’s “most continuously active and largest volcano by volume.” Termed a stratovolcano, it is shaped like a cone, and the ground is often covered with thick, steaming clouds of sulfur escaping from below the surface. If donning a yellow construction helmet and gas mask appeals to you, a company called White Island Tours offers day-trips out to the volcano, departing from Whakatane every morning. If exploring White Island whets your appetite for life on the fault line, there’s more where that came from. The Central Volcanic Plateau, which runs down the heart of the North Island, is home to several other active volcanoes, including Mount Ruapehu, Tongariro, and Ngauruhoe (which you may recognize as Mount Doom from the Lord of the Rings trilogy). 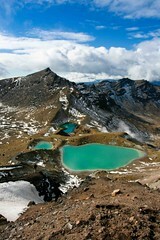 Whether you decide to complete the famous one-day Tongariro Alpine Crossing or take a guided tour up Ruapehu, you’ll find plenty of icy blue crater lakes no matter where you look. From bouncing along Ninety Mile Beach in a dune buggy to digging up hot pools and hiking volcanoes, you might’ve had enough adventure for one trip. 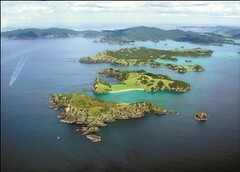 But before returning to Auckland, there’s a final stop left to make along the North Island. The small beachside town of Raglan is known for one thing: surfing. Its dramatic coastline makes for excellent waves and one surf break, Manu Bay, was even featured in the 1966 classic The Endless Summer. The town’s original Maori name, Whangaroa, or “the long pursuit,” might even inspire you to keep paddling towards that perfect wave. Flights to Auckland take approx 26.5 hours from the UK, with most stopping over in Asia. For all you need to know about routes, prices and timings speak to one of our Airfare Experts on 0208 045 4186. Candace's next adventure will be in India as she takes part in the Rikshaw Rally. Follow her progress via twitter @candacerardon.